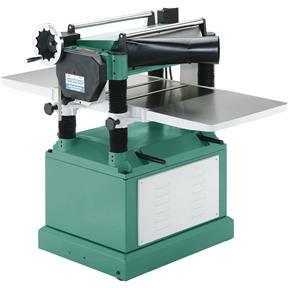 Put this 20" Planer in your shop without breaking the bank. Solid cast iron and steel construction and large planing capacity make this planer a true heavyweight. 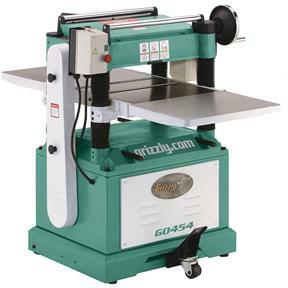 However, with a foot-operated caster system, you won't need to manhandle this planer around your shop. You'll also appreciate the 55-1/2" long precision-ground table, 5 HP motor and the two-speed gear box for maximum versatility. CSA certified meeting CAN/CSA C22.2 #71.2-08 and UL 987 standards! Approximate shipping weight: 920 lbs. I have had my G0454 from a little over a month now. I have put thru a couple of hundred board feet. I did have a problem with the pressure bar being bowed which grizzly promptly sent out a replacement. Take your time setting it up and review the videos and it will leave a nice finish. I have no visible snipe, it did take some trial and error on some of the adjustments though. 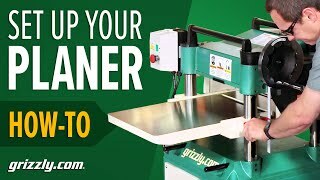 I am really happy with this machine from grizzly. love the planer. The down side, it took over 6 months to get. I have been a long time "Grizzly" supporter. This purchase took almost a year to receive from back-order status, very disappointing. The product works well as for planning large lumber but the dust collection shoot constantly gets clogged even with 2 HP dust collection system. Poor design on this front. I have to rate as average. I bought this item on a presale and it took months to arrive. Well worth the wait! So far I've run about 1K bd. ft. of pine through it and couldn't be more satisfied. Yes I am happy with my new planner. It was worth waiting 11 months for. I finally received my planer after waiting 10 months. I will give a review later. I just got it off the two pallets and it appears to be no damage. The problem was getting it off the pallets as I am a one man shop. I built a 4 foot ramp and us my cars hitch and come along to guide planer. I am excited to use it and will let you know. im soo glad i got this planer !!!! Thank you so much !!!! Waited for this item for 6 months, arrived with damage blades which Grizzly furnished and I replaced. I now have chatter marks and some problems with end snipe. The adjustments are not what you would call precision. It has definitely not been plug and play. I have used it a few times now and my old one will gather dust, Don't know how I worked with out it. Bought this planer to replace my aging 12" planer. So glad I did. 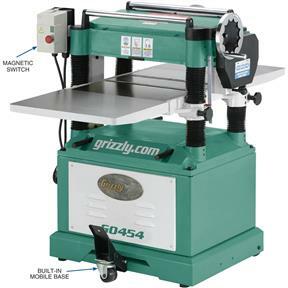 I love the power, extra features (movable base, top rollers, locking spindles) and the ease of setting it up. Most likely the last planer I'll ever have to buy. Nice machine. The first one that was sent was damaged by UPS and it cost me time away from work. The second one showed up a week or so later. Put it together and found nothing out of place. I milled some beetle kill later and what would take hours in the past just took 20 minutes. My neighbor stopped by and is now ready to purchase one for himself. Great machine. Machine arrived in good shape and the setup directions were clear and complete. Planer worked well right from the start. My past experience with Grizzly tools has been that they have poor an non functional on-off switches, this planer on- off is proving to be the same old thing ; did not work at all out of the crate.Took the cover off and bent the linkage and it worked a couple times now it won't turn on, at least it didn't start on fire like my Grizzly wood lathe did. Took three months to get it waiting on back order. So far not a great purchase, just ok.
Great planer set up wasn't bad it was really close right out of the crate. I had a issue with the switch but customer service took care of it with no hassle and sent me a replacement with no issues. Wow, what more can I say about this awesome monster. 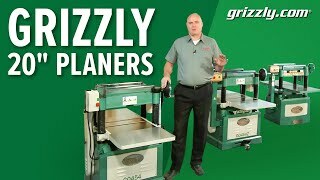 This is a great planer and I highly recommend it. 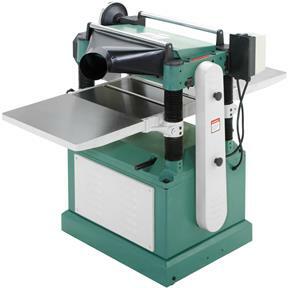 I purchased in 2008, This planer is great. The only thing i would change is the dust collection port is left handed only, not a huge deal but should offer in both directions.